Best size for both home use, car use, and even take it to Travel. 1.Umbrella design is classical and elegant , suitable for women and man. 2.Higher quality,made of strong frame and premium resin-reinforced fiberglass ribs, ergonomic handle is comfortable. 3.Umbrella is compact, light and perfect for travel,can easliy fit in your handbag or backpack. Lighter, Stronger, and Better. Auto Open & Close: One second one hand operation,just push the button once to automatically open and press again to instantly fold the canopy closed.Auto close is handy for quick entry into a car,house or anywhere.High quality design built to last and withstand the strongest winds and rain.It is abrasion resistant, mold and mildew resistant. Compact Design: 12in long and weighs less than 1lb for easy storage in purses, briefcases, backpacks, luggage and more. It is perfect for travel, business, camping, fishing, and daily use. Suitable for men and ladies. 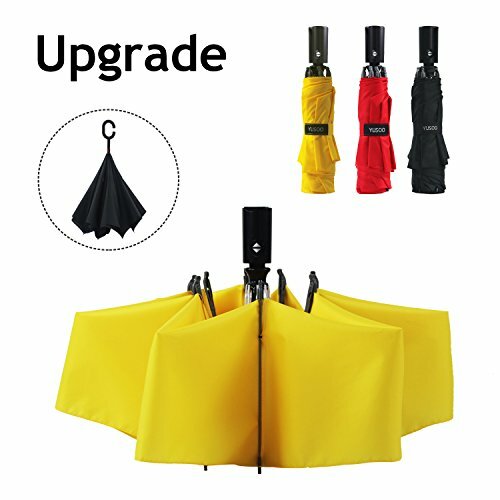 Inverted & Reversed Folding Design: This yellow auto upside down umbrella takes a inside out design. When close it, the wet part will be inside of the umbrella, preventing water from dripping,and it will not get yourself wet when getting in and out of the car. You don't even need to worry about this automatic travel umbrella will wet your floor and mat. Waterproof & Windproof: Select 210T canopy material enables our yellow umbrella to repel water easily and quickly. Sturdily built structure with the strengthened black metal shaft and 8 fiberglass ribs, our umbrella is durable and strong enough to last through the harsh wind without turning inside out. Using this reverse umbrella, you are always protected from rain, wind and UV. After Sales Service: Auto open & close reverse folding umbrella with various colors , it is ideal gift for your women, men ,girls and boys. YUSOO team provides high quality products and satisfactory service for you! If you have any question, please contact us any time and we will give you satisfactory service. If you have any questions about this product by YUSOO, contact us by completing and submitting the form below. If you are looking for a specif part number, please include it with your message.